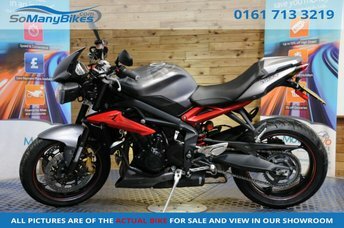 2016 (16) Triumph Street Triple 675 R ABS - Arrow exhaust - Comes with Owners Manual and Service book - Here at SoManyBikes we are committed to bringing our customers the best finance deals. Thats why we offer low rate finance with a low deposit, with an extended warranty and even poor credit finance! We carry a huge range of stock with competitive prices, full parts and labour warranty packages (that actually work!) and hassle-free, friendly service. Have your new bike delivered by our professional and affordable transport service - www.moveamotorbike.com. Visit www.somanybikes.com or call our friendly staff on 0161 713 3219 for help and advice on your next bike! Offering a range of engines and specifications, Triumph's Street Triple line-up has something to suit every rider and style. Discover all about the Street Triple S, R and RS models by speaking to a member of the team at CarBay Limited today. Our experienced staff will be able to supply advice and guidance, and will always go the extra mile to ensure you find the right pre-owned bike to suit your requirements. You'll find all of our current used Triumph Street Triple motorbikes listed here on the website, and don't hesitate to contact the showroom with any questions and to arrange a test ride. Rest assured that all of our second-hand motorcycles are put through a rigorous testing process before going on sale.